Bama Performance is on a mission to take a stock 2003 Cobra and turn it into a quarter-mile killer! The 2003 Mustang Cobra, aptly referred to as the Terminator, is one of the most sought after and desired Mustangs. From the factory the 2003 – 2004 Cobra was a Mustang to be reckoned with as it featured a supercharged 4.6L 4-valve motor that was underrated, backed up by a Tremec transmission, and IRS. Over the past decade the Cobra has aged incredibly well and now that Bama has their hands on one they will build it up and push it to the max! 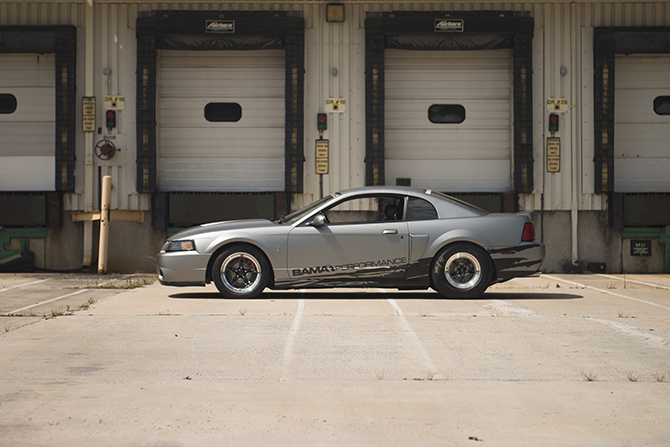 The Bama Performance Cobra is an all business Mustang focusing intently on improving performance. In Stage 1 of the build Bama added a laundry list of engine goodies. A C&L Cold Air Intake and SCT BA2600 Meter now feeds cold air into an Accufab Oval Throttle Body and Power Inlet Plenum. Bama added a mix of Metco Motorsports parts such as an Interchangeable Supercharger Puller & Hub Ring, a Crank Pulley Kit, Dual Bearing 90mm Auxilary Idler Kit, and a Supercharger Pulley Installation and Removal Tool. Bama did not stop there, they also added a MSD Programmable Fuel Pump Voltage Booster and Autolite Racing Spark Plugs. To have everything running in harmony, Bama added a custom tume via the X4/SF4 Handheld tuner. All of these performance parts help to not only allow the Cobra to breathe better, but they also help to optimize the stock supercharger. These Stage 1 performance mods raised the stock boost level up to 15 lbs. which is the ideal amount of boost for the stock 03-04 Cobra blower. It would be a mistake to do all of these power and performance mods without upgrading the handling of the Cobra at all. Bama added Maximum Motorsports Low Profile IRS Subframe Bolts and Power Stop Street Warrior Brake Rotor and Ceramic Pad Kit. Now that Bama added all of this extra power it important to be able to stop it all once it is already going, and the Power Stop brake kit will have no issues stopping this Cobra. With the addition of low profile IRS Subframe bolts, Bama will be able to add much larger tires for improved grip at the track. Even though there are no dyno and track results until Stage 2, it is quite evident that Bama is serious about squeezing every drop of power they can out of this Cobra and they are well on their way to doing so. The Bama team has big plans for this build and they are going to stop at nothing to hit their goals.